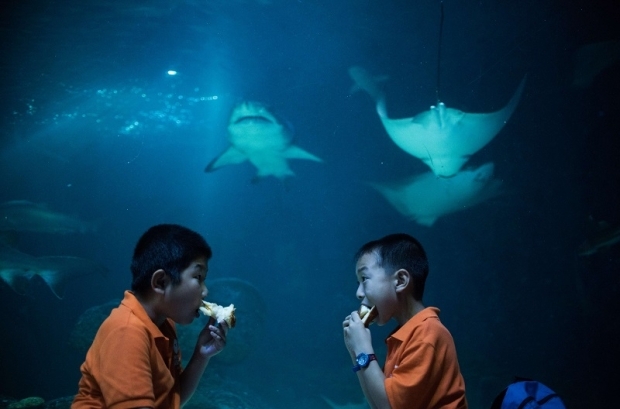 Two boys eat dinner in front of rays and a shark during a sleepover event at the Changfeng Aquarium in Shanghai, August 18, 2015. By Kabir Sehgal, author of five books including New York Times bestseller Coined: The Rich Life of Money And How Its History Has Shaped Us. Sehgal was a vice president in emerging market equities at J.P. Morgan and is a Grammy-award winning producer. This article was first published by Foreign Policy’s China channel, Tea Leaf Nation. Two fictitious Chinese brothers are born in Tuanjiehu Maternity Hospital in the Chinese capital of Beijing. Let’s say the first was born already, in late 2015; his parents nickname him Laoda, meaning “oldest child.” That’s because they have hopes for a second, who it turns out will be born in 2017; his parents will nickname him Lao’er, meaning “second child.” That Lao’er will even be born at all, to parents not eligible to have a second child under China’s previous family planning policy, will be something of a reproductive windfall for the family. In late October 2015, the ruling Chinese Communist Party announced that it would relax what is known in the West as the “one child policy”—decades-long legal restrictions that have limited most Chinese couples to only one child—and allow all married couples, like the parents of Laoda and Lao’er, to have two children. Lao’er’s parents will be happy to have a larger family—and, crucially, Chinese officials will be happy to have more consumers. But the global financial crisis in 2008 exposed China’s lopsided economy, as sinking global demand for Chinese products generated slower growth and higher unemployment. The crisis was a wake-up call for China’s policy makers. They realized the veracity of then-Premier Wen Jiabao’s pre-crisis warning that China’s economy was “unstable, unbalanced, uncoordinated, and unsustainable.” It’s not just the economy that has become unbalanced, but also China’s demographics. Its working-age population declined in 2012 and is projected to decrease slowly through 2030. During the 2020s, China is expected to have a shortage of 4 to 6 million workers. According to Credit Suisse, shifting to a two-child policy would introduce an army of 3 to 6 million additional newborns every year. Facing demographic and economic headwinds, Chinese officials have realized that a shift to a more consumer-based economy can’t happen without more robust population growth. According to Credit Suisse, shifting to a two-child policy would introduce an army of 3 to 6 million additional newborns every year (as much as three times the size of China’s military), which would account for $19 billion to $38 billion in incremental consumer spending—or 4 to 6 percent of all retail sales within China, a meaningful influx even for China’s huge economy. Strong government measures to boost consumption certainly aren’t new. (A key priority of the Twelfth Five-Year Plan, running from 2011-2015, was to rebalance China’s economy towards more domestic consumption.) As those plans reach fruition, the consequences will be global. “If China does the transformation from the producer, export-led growth model that relies on others to provide its major source of demand to more of a consumer-led model, it will become a source of growth for other countries around the world,” says Stephen Roach, an economist and former Chairman of Morgan Stanley Asia. Imagine that one day, American manufacturers will export toy trains to China so that Laoda and Lao’er can play with them after supper. But in order for China to grow domestic consumption, China’s consumers, who still over-save, must spend a greater share of their take-home pay. The immediate demands of growing children are one way to channel money away from savings accounts and into the consumer sector. As Laoda and Lao’er age, they will become consumers themselves. They and the 3 to 6 million new babies will grow into teenagers who make their own spending decisions. Companies that cater to this age group should benefit, from fashion retailers and fast casual restaurants to video gaming companies and online messaging services. As the boys get older, successive five-year plans may reflect their maturation as consumers and encourage spending through subsidies. China may extend subsidies for compulsory education to all families with two children. As Laoda and Lao’er enter the labor force, China may broaden subsidies to encourage car buying. And by the time Laoda and Lao’er settle down and have children themselves, China may reward them with a “baby bonus,” a direct payment for having more than one child. To be sure, creating a new influx of consumers will be a challenge. Despite partial rollbacks in China’s one-child policy over the years, China’s fertility rate has not increased dramatically. Chinese are still reluctant to have more children because raising a child there is expensive, costing parents about $3,622 per year, equivalent to about 43 percent of an average Chinese family’s take-home pay. Though China isn’t yet offering subsidies to have more children, it is trying to make some of the costs of child-raising more affordable, introducing measures to dampen the costs of housing, healthcare, and some consumer goods. In a 2008 study commissioned by the Chinese government, 81 percent of the 38,000 males and females that participated said they preferred having only one child; and 15 percent said that they desired a second. Nevertheless, the two-child policy will bring millions of new consumers into the fold in subsequent years. That will unleash demand and abet China’s overdue economic rebalancing. It will also mark an ironic turn. The original one-child policy was founded on fears that too many people would gobble up the country’s scarce resources after an ill-advised surge in population under Mao, who decreed that more children made for a stronger China. Now policymakers, who realize that China needs healthier population growth in order to promote economic advancement, are reversing yet again. In order for China to remake itself, it paradoxically needs more, not fewer, mouths to feed.